Is body mass index (BMI) relentlessly increasing in NZ, or plateauing? In this blog we present trends in BMI by ethnicity in NZ going back to the 1980s. Over the last four decades the annual increase in BMI is linear, relentless increasing; no sign of a plateau, yet. Given this trend, The Diabesity Crisis symposium just held in Auckland, under the auspices of the Better Start and Healthier Lives National Science Challenges and Edgar Diabetes and Obesity Research seems aptly named. What are the forthcoming research and policy priorities? The Ministry of Health has a very user friendly tool for accessing Health Survey data, including for trends over time. 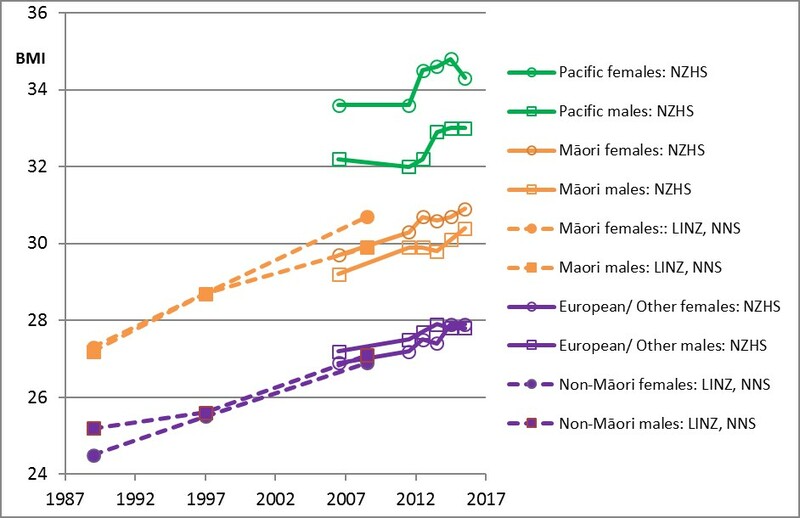 Using this tool, body mass index (BMI) has shown statistically significant increases over the last 10 years for both Māori and European/Other. But are these increases slowing? And how do they compare with past trends? There is nothing like a long time series to gain an understanding about trajectories. We have previously collated data on trends in body weight, energy intake, saturated fat intake, and smoking as far back as we could go, in the book The Healthy Country.1For this blog we pulled out the data on adult BMI from 1989 (Life in New Zealand Survey) and the National Nutrition Surveys in 1997 and 2008-09, and tacked them on to annual NZHS data from 2006/07 to 2015/16. The results are shown in the graph below. 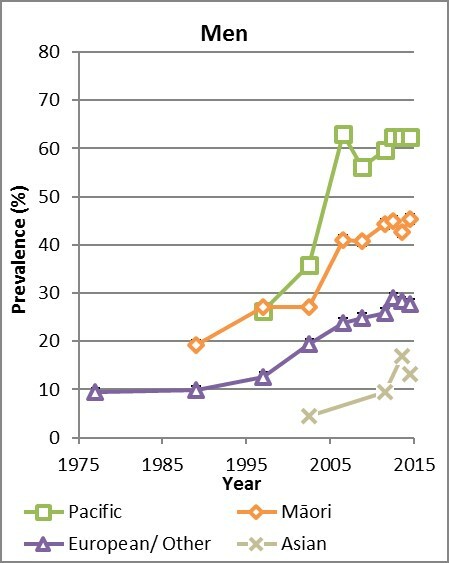 Previously we have collated trends in prevalence of obesity (i.e. BMI > 30) 2; the trends are also inexorable. Figure below. 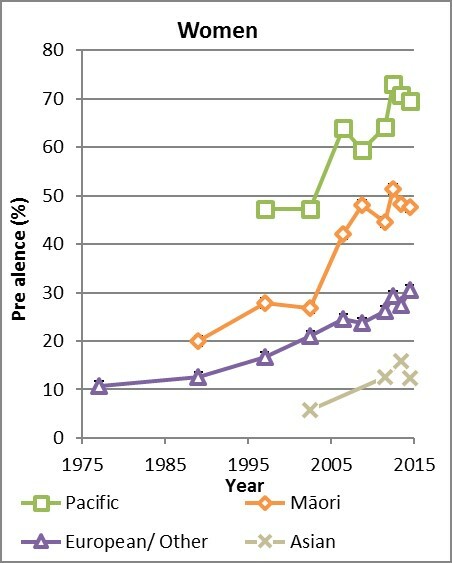 Footnotes: The crude obesity prevalence rates from National Nutrition Surveys (NNS) and New Zealand Health Surveys (NZHS) use an obesity definition of a BMI of ≥30, except for Māori and Pacific peoples before 2000 when it was ≥32. The age group was 15+ year olds except for in 1977 (20–64 years) and 1989 (15–74 years). European/Other obesity figures in 1977 and 1989 are estimated from the total population. The adult NZ graphs show a persistent, monotonic and linear increase over the last 30 years. A relentless increase – at least for Māori and European – with no evidence of plateauing. Internationally, similar inexorable trends are seen in the USA 3, although in the UK there appears to be some flattening off in adult BMI trends. And perhaps in Auckland, NZ, there is some falling off of obesity rates among pre-school Pacifica (page 24 of this report) – but it is early days. Against this backdrop, the Better Start and Healthier Lives National Sciences Challenges and Edgar Diabetes and Obesity Research hosted The Diabesity Crisis symposium last Friday, preceded by a Kim Hill convened panel debate on the cost of sugar on Thursday night (watch for an announcement of when this will play on Radio New Zealand). The seminar included a range of informative ‘overview’ presentations. Evidence that intense early childhood interventions can reduce child obesity – but as soon as the intervention stops, the BMI reverts back to what it would have been with no intervention. One answer for this sobering lack of persistent benefit is to keep going with interventions throughout childhood. This may even be cost effective if – eventually – the rates of diseases are lessened in the (distant) future. However, it is hard to escape the reality that child BMI is largely influenced by the environment (e.g. the evidence produced by KidsCam), so tackling the obesogenic environment has to be the main area of focus. Intriguing findings on sleep and the gut microbiome; kids who sleep longer each night may put on less weight, and a diverse gut microbiome may be protective against developing obesity. Even more intriguing is the emerging evidence that faecal transplants from thin mammals (in mice experiments mainly) can reverse obesity – however more human trials are required to understand what the benefit of this approach may be for a public health intervention. The benefits of high intensity interval training (physical activity); if programmes can be designed that appeal to and engage teenagers, substantial gains may be possible here. The link between obesity and diabetes is well known. But there is fascinating evidence emerging of how gastric bypass surgery works mostly by changing hormones – not so much the mechanical effects of restriction. Bypass surgery is a near-miraculous treatment (even cure) for most obese patients with diabetes. But neither can we afford ‘gastric bypass surgery for all’ nor is it a particularly palatable solution. However, the rapidly advancing understanding of the genetics and hormones of obesity is deepening our understanding of the obesity epidemic, and should lead to new drug treatments as a complement to intense community-wide prevention. There was a collective view that there was no single solution, but a multipronged approach was required to prevent and manage the diabesity crisis. Onwards with policy, to hopefully turn around the BMI trends shown above. Woodward A, Blakely T. The Healthy Country? A History of Life and Death in New Zealand. Auckland: University of Auckland Press; 2014. Freedman DS, Zemel BS, Ogden CL. 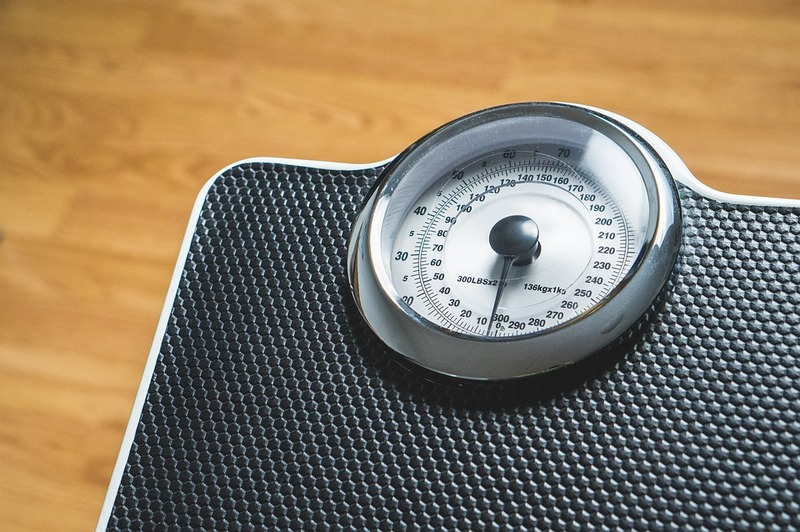 Secular trends for skinfolds differ from those for BMI and waist circumference among adults examined in NHANES from 1988-1994 through 2009-2010. Am J Clin Nutr 2017; 105(1): 169-76. Also, can you explain, please, why life expectancy is increasing when we are all getting fatter and more unhealthy (apparently)? I really want to know! P.S. Thank you for including distinct data for pacific peoples, the data for them, indicates the enormous need for the highly targeted programmes that are in places in areas such as parts of South Auckland. That is where the crisis really sits. Good question Anna. As you have implied, BMI isn’t ideal, but we have it. For the willing and motivated individual there are more accurate mechanical ways of measuring fat, e.g. with calipers. Personal trainers and gyms often use them because they avoid the confusion of dense heavy muscle with fat. I have a pet theory to explain Pakeha obesity: traditional Anglo-American (NZ pakeha) food is pretty bland (think meat and three veg) so unhealthy processed food tastes way better in comparison. It’s also easy and fast. Between these factors there is little incentive to switch to healthy meals when people don’t know how to make healthy food that actually tastes nice. Compare obseity rates in the UK and Germany to those it Italy and France: where people know how to use herbs and spices in their food, they’re less drawn to the processed stuff. I would guess that it’s similar for Chinese and Indian cuisine. Maybe the government should try a series of small test interventions (evidence based policy…) where they distribute Jamie Oliver books and $200 supermarket vouchers and see if people gradually make the switch.